With the ultra-compact Allied Vision Mako camera family, measuring only 49.5 x 29 x 29 mm, Allied Vision offers an entry level model at an interesting price / performance ratio. The cameras incorporate the latest high quality sensors in robust housings, designed for the demanding environmental conditions of industrial imaging. 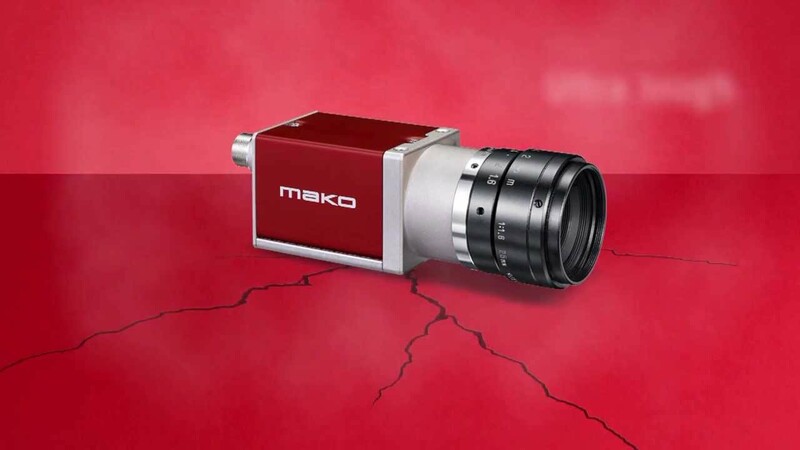 The Mako series is equipped with an interesting choice of CMOS and CCD sensors in monochrome and colour, offering resolutions from VGA up to 5 megapixels. All models include a power over interface option, 3 opto-isolated I/Os and a 64 MB FIFO image buffer. The Mako is a low-cost machine vision camera that comes with a GigE Vision or USB3 Vision interface. The GigE Vision models offer resolutions from VGA to 4 megapixels and are available with CCD as well as CMOS sensors with global shutter, including CMOS variants with increased infrared sensitivity. The USB3 Vision models offer resolutions from VGA up to 5 megapixels. They are available with the fast Python and Aptina global shutter CMOS sensors. The Mako series incorporates both colour and monochrome models. Depending on the model, the Mako has impressive frame rates at full VGA resolution. USB3 Vision Mako variants deliver up to 550 images per second while the GigE variants deliver up to 300 images per second. 1 or 2 (model dependent) opto isolated GPIO lines provide the ability to be configured as either input or output, providing a high flexibility. The remaining two non-isolated GPIO lines are TTL-based and also programmable as input or output.By offering functionality that would otherwise be provided by external components, implementation time and cost can be reduced, while making maintenance easier by having less components in the system. Mako GigE Vision models can be powered directly from the interface cable (PoE for GigE Vision models), or can be supplied using a Hirose connector with up to 24 volts. USB3 Vision models offer Power over USB. AV MAKO G-030B POE 0.3 309 C-mount 644 484 1/3"
AV MAKO G-030C POE 0.3 309 C-mount 644 484 1/3"
AV MAKO G-032B POE 0.3 102 C-mount 656 492 1/3"
AV MAKO G-032C POE 0.3 102 C-mount 656 492 1/3"
AV MAKO G-125B POE 1.2 30 C-mount 1292 964 1/3"
AV MAKO G-125C POE 1.2 30 C-mount 1292 964 1/3"
AV MAKO G-131B POE 1.3 62 C-mount 1280 1024 1/1.8"
AV MAKO G-131C POE 1.3 62 C-mount 1280 1024 1/1.8"
AV MAKO G-192B POE 1.9 60 C-mount 1600 1200 1/1.8"
AV MAKO G-192C POE 1.9 60 C-mount 1600 1200 1/1.8"
AV MAKO G-223B NIR POE 2.2 49.5 C-mount 2048 1088 2/3"
AV MAKO G-223B POE 2.2 49.5 C-mount 2048 1088 2/3"
AV MAKO G-223C POE 2.2 49.5 C-mount 2048 1088 2/3"
AV MAKO G-234B POE 2.35 41 C-mount 1936 1216 1/1.2"
AV MAKO G-234C POE 2.35 41 C-mount 1936 1216 1/1.2"
AV MAKO G-319B POE 3.2 37.5 C-mount 2064 1544 1/1.8"
AV MAKO G-319C POE 3.2 37.5 C-mount 2064 1544 1/1.8"
AV MAKO G-419B NIR POE 4.2 26.3 C-mount 2048 2048 1"
AV MAKO G-419B POE 4.2 26.3 C-mount 2048 2048 1"
AV MAKO G-419C POE 4.2 26.3 C-mount 2048 2048 1"
AV MAKO G-507B POE 5.1 23.7 C-mount 2464 2056 2/3"
AV MAKO G-507C POE 5.1 23.7 C-mount 2464 2056 2/3"
AV MAKO G-508B POL POE 5.1 23.7 C-mount 2464 2056 2/3"
AV MAKO U-029B 0.3 550 C-mount 640 480 1/4"
AV MAKO U-051B 0.5 391 C-mount 800 600 1/3.6"
AV MAKO U-130B 1.3 168 C-mount 1280 1024 1/2"